Stufflebeam became interested in horticulture, and the young couple opened a landscape business in McKinney. Soon, the two-lane highway on which the property sat had expanded to six lanes, and the landscape business was suddenly across the highway from a Home Depot. When Stufflebeam had the opportunity to sell the business and the property, he seized it—allowing the couple to move farther out of town. “I’ve been chased by the growth of suburbia since I was a child in Richardson, Texas!” he says with a rueful laugh. “When we closed on this property in 2004, a Home Depot, a Lowe’s and a Starbucks opened in Brenham. "We need more growers out here. 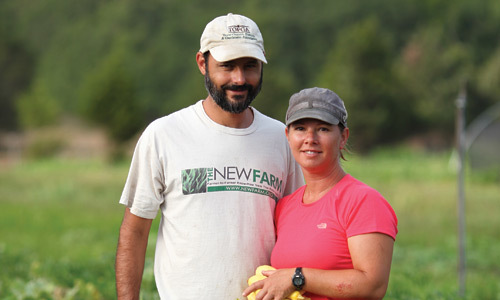 We began farming to build the life we wanted as a family, but part of my original dream was to be a small-farm resource—a sort of laboratory for showing people what can work, what can be achieved." 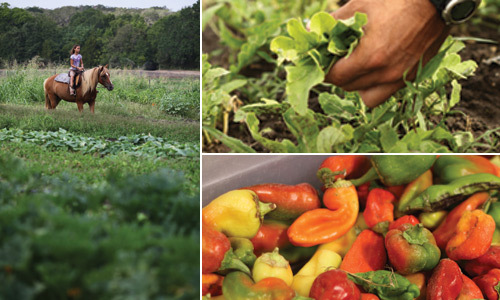 Stufflebeam’s success lies in the very things that make his farm sustainable: smart planting and grazing, structures that do part of the work and community effort. Carina and Brooke oversee all the farm’s animals—including four Haflinger draft horses that plow the fields; three dairy cows that supply the family with milk and will, one day soon, support the farm’s commercial cheesemaking operation; about 100 laying hens; and various dogs, rabbits and cats. Farm buildings include a barn that serves as crop storage and provides space for regular market days, and will soon house a commercial kitchen to create value-added products that will supplement the bottom line. A well house recently built by a Home Sweet Farm community-supported agriculture (CSA) program member is a personal favorite. “This is the well house of my dreams,” Stufflebeam says, smiling. “The guys who designed it are brilliant. The water is stored up top, so that it can be pumped to the house or the fields with gravity, and it creates a cool cellar underneath for storing root vegetables and storage crops. And all it cost me was materials and some cucumbers.